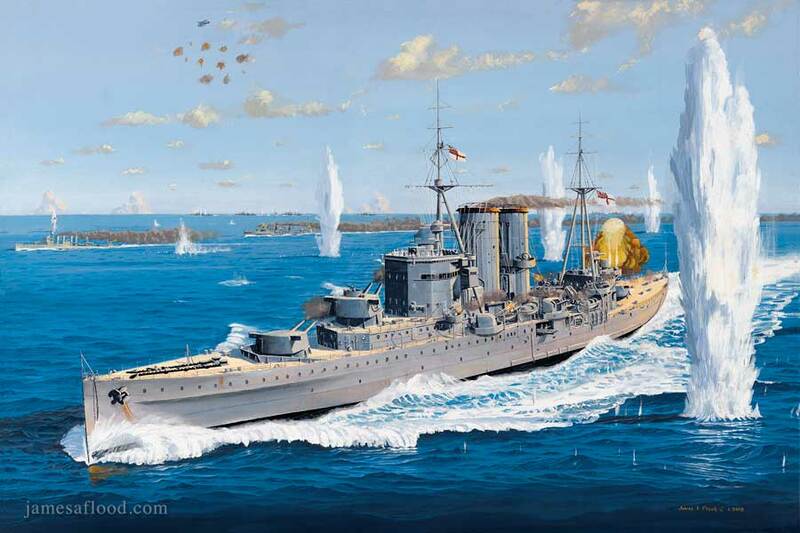 HMS Exeter is portrayed fighting her last battle on 1st March 1942, after being trapped by Japanese forces in the Java Sea. Already justly famous for her part in the December 1939 South Atlantic engagement known as The Battle of the River Plate, which led to the destruction of the German ‘pocket’ battleship Admiral Graf Spee off Montevideo, HMS Exeter was herself cornered and sunk in similar circumstances. On 27th February 1942, she had participated along with American, Australian and Dutch cruisers and destroyers in the confused and strategically flawed engagement known as The Battle of the Java Sea. During that battle, HMS Exeter was hit in ‘B’ Boiler Room by an 8” Japanese shell, which drastically reduced her speed, forcing her to retire to Surabaya to effect emergency repairs. During that same battle the Dutch destroyer Hr Ms Kortenaer and the British destroyers HMS Electra (attempting to protect HMS Exeter) and HMS Jupiter were sunk, while later that same evening the Dutch cruisers Hr Ms Java and Hr Ms De Ruyter were also sunk. On the evening of 28th February, after completing what basic repairs she could at Surabaya, HMS Exeter, accompanied by the destroyers HMS Encounter and USS Pope, attempted to escape into the Indian Ocean via a circuitous route through the Java Sea, intending to use the Sunda Strait to exit. However, four Japanese heavy cruisers and their accompanying destroyers found her hundreds of miles short of there on the morning of 1st March and a new encounter ensued; a naval battle which is oft now referred to as The Battle off Bawean Island. Initially the allied trio was detected while heading west by a Japanese destroyer which was accompanying two Japanese heavy cruisers. Realizing that her small band was in no condition to fight a prolonged engagement, HMS Exeter turned north hoping to evade. However, within the hour, and with the initial Japanese force in hot pursuit, she ran head on into two more Japanese heavy cruisers and their accompanying destroyers coming in from the northwest! Cornered, she turned back east and a running battle ensued until she was finally overwhelmed by the odds against her. HMS Exeter is depicted here trading salvos with the enemy at the end of that running battle only moments before the fatal hit that knocked out all her electrical power and stopped her dead in the water, leaving her at the enemy’s mercy. Her main 8” gun battery is seen engaging two Japanese heavy cruisers in the far distance starboard aft on the southern horizon (HIJMS Nachi and HIJMS Haguro) while her port torpedoes have just been fired at the other two Japanese heavy cruisers on the northern horizon (HIJMS Myoko and HIJMS Ashigara). USS Pope, who has just come across from off HMS Exeter’s port flank, and HMS Encounter are laying down a protective smoke screen between her and the Japanese destroyers whom they are also engaging with their guns. Out of range, a Japanese spotter plane is not affected by the anti-aircraft fire coming from the allied ships. Unfortunately for HMS Exeter, because of ongoing problems with her main gun rangefinder, she is unable to ensure a high degree of accurate fire on the Japanese cruisers, while they in turn have finally begun to straddle her with numerous accurate shell bursts, many of which erupt in huge plumes some 100 feet high in the nearby waters. Moment’s later one of these 8” shells reportedly strikes HMS Exeter and enters ‘A’ Boiler Room, knocking out all her power. Gun turrets can now no longer train or operate*, and with the fight having suddenly become very one-sided Captain Oliver Gordon orders scuttling measures to be taken, and then finally the dreaded order “Abandon ship!” is given. Shortly after all survivors are off the sinking ship, and as she is listing to port, at least one or more Japanese torpedoes strike HMS Exeter; she defiantly rights herself one last time and then heels over to starboard and goes down in 34 fathoms of water with her white Battle Ensigns still flying. The protecting destroyers were not spared either, with HMS Encounter sinking nearby at almost the same time, while USS Pope is sunk several hours later by aerial attack**. Thus ended HMS Exeter’s gallant final battle and the allied naval defense of Java. Survivors off all three ships, of whom there were many, spent the remainder of the war in Japanese prison camps. *When the wreck of HMS Exeter was discovered and dived for the first time in 2007, her turrets and guns were found at the angle and elevation as depicted in this painting. **In late 2008 the wreck of USS Pope was also located some 60 nautical miles away. Artist’s note: This painting was commissioned by Kevin Denlay, one of the explorers aboard the dive vessel MV Empress which discovered the wrecks of HMS Exeter and HMS Encounter in February 2007 after a prolonged five year search. In 2008 he participated in a memorial service - held over the wreck site aboard the modern Type 23 Duke Class frigate HMS Kent - which included four survivors from HMS Exeter herself to whom Kevin presented the white Royal Navy Ensign that he had ‘flown’ on the wreck on one of his dives. Kevin has also been intimately involved with the artist in the lengthy process of creating and finalizing this depiction of the action. Extensive use was made of his detailed photographic images and video footage gathered while surveying the wreck along with his comprehensive research of the action that included both historical texts and contemporary resources (i.e. various historians and survivors from HMS Exeter) and reference to his collection of period photographs of all the combatants involved. Kevin lives in Australia and is a Fellow International of The Explorers Club (New York). Since 1995 he has been actively involved in the discovery of and/or first dives on numerous other historic shipwrecks in various locations around the world and he dedicates this painting to all the servicemen who ‘fought it out’ in World War ll. Historic assistance provided exclusively by a gentleman and historian who wishes to remain anonymous.